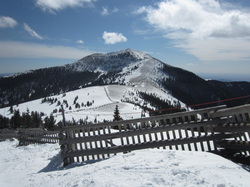 Located in Ruidoso, New Mexico, Ski Apache is New Mexico's premier ski and snowboard resort. Fifty-five trails, beginning at 11,400 feet, fan out for skiers and snowboarders of all levels with a fall line of over 1800 feet, making skiing and snowboarding enjoyable for everyone. Safety is a prime concern of the Ski Apache Ski Area. The Ski Apache National Ski Patrol’s mission is to keep the skiers and snowboarders safe, respond to medical emergencies and provide customer service on the Mountain. Staying safe at Ski Apache is everyone’s responsibility. Whether you’re a seasoned black diamond rider or just beginning in snow sports, safety is an important part of enjoying the Mountain. Besides our Ski Patrol staff, there are approximately 80 volunteer National Ski Patrol personnel associated with Ski Apache. Most salaried personnel are EMT qualified and the National Ski Patrol personnel are Outdoor Emergency Care qualified. Many of the National Ski Patrol personnel are also nurses, paramedics and doctors in their regular careers. Additionally ski patrol members participate in a safety and first aid refresher training course each year. Check out the rest of our site to learn more about our organization and how to join! ​For more information contact David Budak at adbudak@yahoo.com. Our application is on the Contact Us Tab of this website. Also, feel free to stop by the Ski Apache First Aid Station on weekends during the ski season to discuss becoming a member of the Ski Apache Patrol.